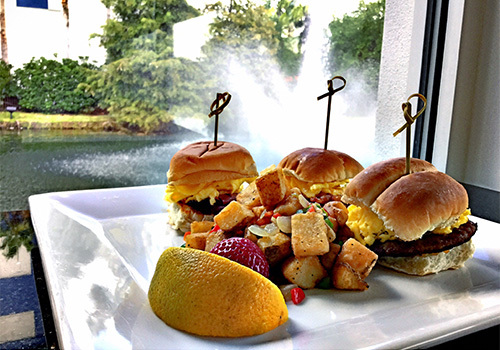 Featuring shuttle transportation to top Orlando theme parks such as Walt Disney World and Universal Studios, this hotel offers a variety of comfortable and entertaining amenities to guests. 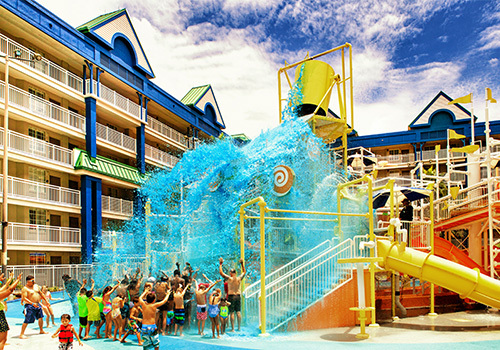 Families can enjoy the onsite water park and 4-D interactive activities. 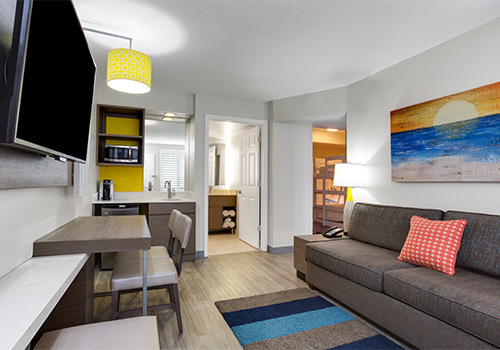 Suites feature mini refrigerators, complimentary coffee/TV, and flat-screen TVs. This hotel is a smoke-free property. 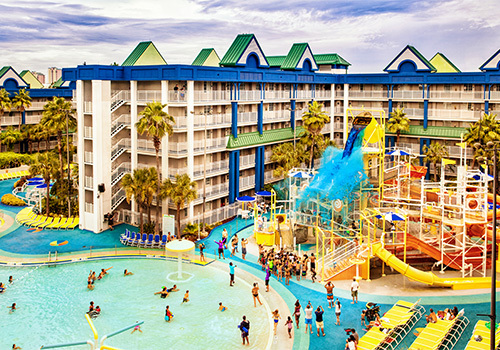 Splash away at the resort waterpark featuring water slides, flumes, cozy cabanas, and a poolside bar. 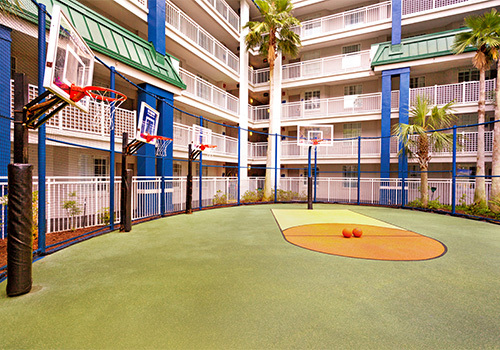 Conveniently located within 1 mile of Walt Disney World resort with theme park shuttle service. 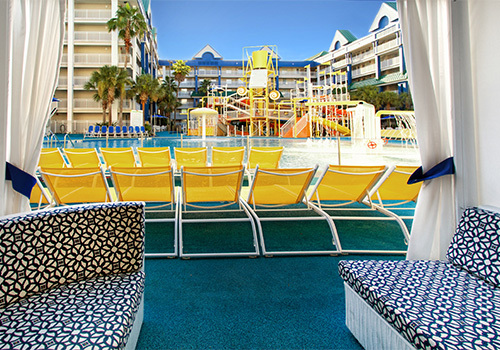 Kids and adults alike will love the 4-D Experience, Batman Laser Challenge, poolside entertainment and 3,000 SF Arcade. 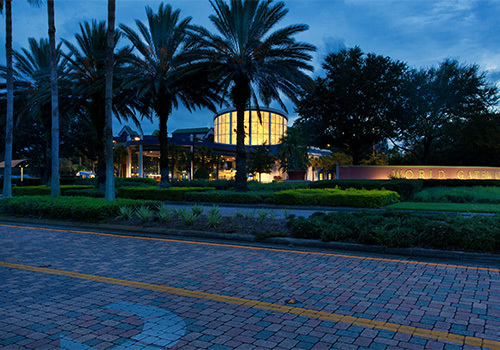 Enjoy the only all-suite Holiday Inn Resort in Orlando, Florida at the entrance to the Walt Disney World® Resort. 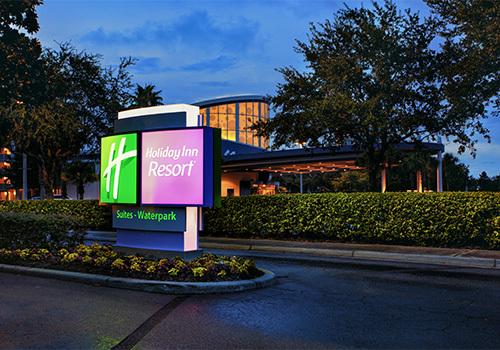 The Holiday Inn Resort Orlando Suites - Waterpark in Lake Buena Vista completes a $30 million top-to-bottom rebuild in 2016 and is located in the heart of Orlando on 24 acres, 1 mile from the Walt Disney World Resort theme parks. 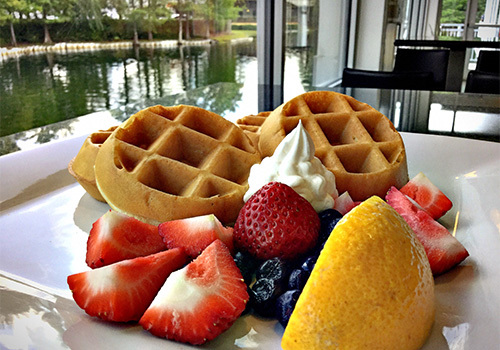 The resort is near Universal Studios and Islands of Adventure featuring The Wizarding World of Harry Potter, CityWalk, SeaWorld, Aquatica, Discovery Cove and the I-Drive entertainment district featuring I-Drive 360, home of the Orlando Eye and Orange County Convention Center. 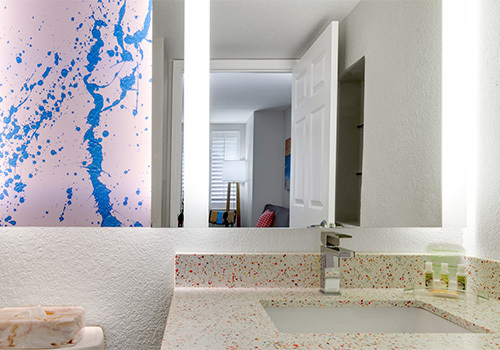 Our location is easily accessible to shopping at both Orlando Premium Outlets and The Mall at Millenia. 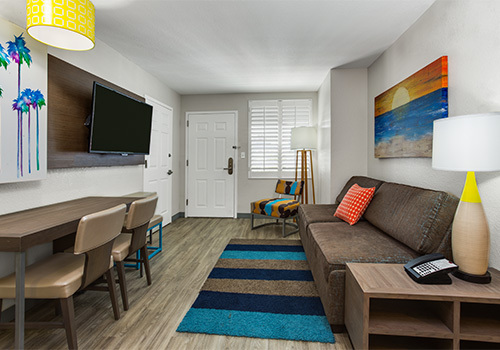 Our newly remodeled Orlando family resort features 777 spacious suites with choice amenities, including free high-speed internet access, microwave, mini-fridge, 42" HDTVs, and Bath & Body Works bath amenities, water park with slides and flumes alongside cozy cabanas and a poolside bar. At our Orlando resort, each family member can enjoy the 4-D Experience, Batman Laser Challenge, poolside entertainment and 3,000 SF Arcade. 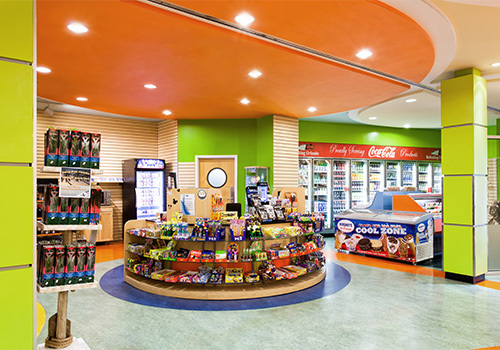 The resort’s Marketplace is the hub of shopping, dining, and entertainment with its convenience store, souvenir shop, restaurant, food court and bar. It's also your jumping-off spot for all major Orlando area attractions with our convenient complimentary scheduled shuttle service. Self-parking fee: USD 15.00 per day, plus tax. Additional vehicles are $17 per day per vehicle plus tax. NOTE: Effective January 7, 2019 through February 7, 2019, the Lagoon Pool Waterslide Tower will be unavailable for guests use to make improvements for guests’ future enjoyment. During this time period, the Lagoon Pool Area, Kids Splash Zone, Cabanas, Deck Chairs and Loungers will be available for guest’s use along with the normal Lagoon Poolside entertainment and activities. In addition, the Oasis Pool area will have an array of fun activities including a 3 story inflatable waterslide for guests' enjoyment. All this, in addition to the normal fun-filled resort amenities and attractions will be available for guests use. The Lagoon Slide Tower will reopen on Friday, February 8, 2019. 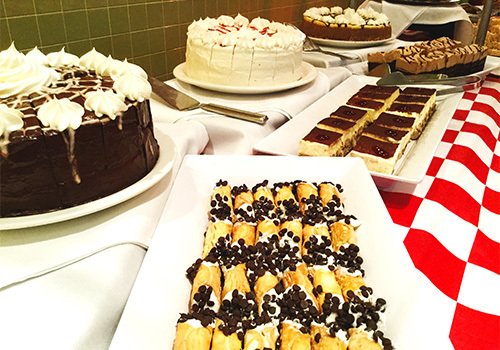 Check-in begins at 4:00 PM and check-out ends at 11:00 AM. Yes. Onsite parking is available for $12 per day and $17 per day per additional vehicle. No. The hotel does not allow pets. No. The hotel property is 100% smoke-free. 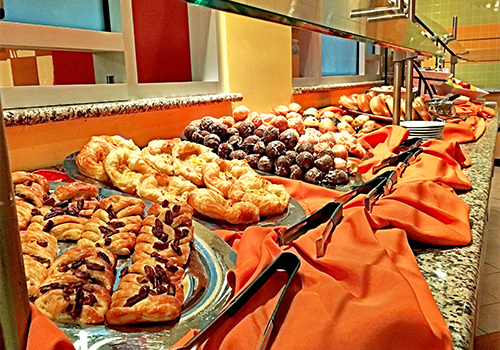 What hotel amenities are available to guests? Waterpark with 7 slides, pools, and whirlpools. 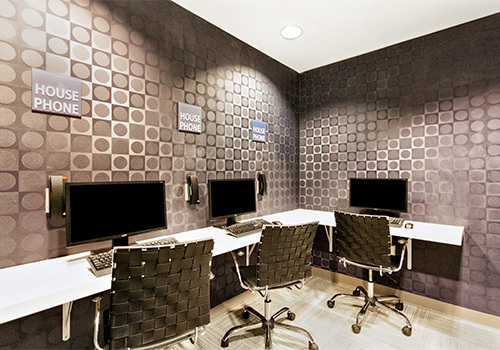 What amenities are included in the suites?